Jane Roberts and Wolfgang Pauli Explain the Bridge between Psychology and Quantum Mechanics « CONSTABLE RESEARCH B.V. The books of Jane Roberts (1929-1984) had a deep impact on my “Scientific” insight about the Universe. The books of Seth are still valid and many things that were explained by Seth are now proven to be true. Jane Roberts was a writer and a channel. In this state she was taken over by an entity called Seth. I became interested in Seth and Jane when I was a student (Mathematics, Chemistry, Physics, Psychology, Philosophy). Seth dictated many theories of physics that were at that time (1980) rather unknown. Jane was totally not educated in my field of Science. I wondered how this was possible. Seth explained that there are four universes where we live in and these four universes are part of a multitude of other universes. What Seth explained was the so called many-worlds-hypothesis. It was formulated to explain Quantum Mechanics (The so called Oxford Explanation). Bohr and Heisenberg formulated another explanation (The Copenhagen Explanation). The four worlds are: the Physical universe, a Dream universe, the Electrical and an Anti-Matter universe (Our Twin Universe). The last one was not explained by Seth. The Twin Universe was outside his Frame of Reference. Our physical universe is created by the power of our mental projections. When people share the same projections they are able “to Move Mountains”. “You usually think, for example, that your feelings about a given event are primarily reactions to the event itself. It seldom occurs to you that the feelings themselves might be primary, and that the particular event was somehow a response to your emotions, rather than the other way around. The all-important matter of your focus is largely responsible for your interpretation of any events”. This is an important insight. It is a very powerful tool for change. When a collective projects Peace on Earth or The Restoration of Nature it will happen. The Mass Media could help by projecting “positive thoughts”. At this moment they accomplish the opposite. Seth also gives an explanation of Time/Space (The Chronotope). Past and Future coexist with the Present. They are created in the Now. This is currently the most interesting theory explaining strange effects (the Bell Tests) in Quantum Physics. All our “Representations (“bodies”)” in Time/Space (the “many worlds“) are in direct contact with something called the Inner Self. The Inner Self is the Observer and it gives “feed-back” to all the representations. 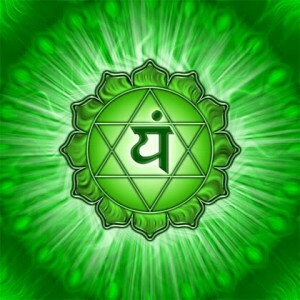 In every representation the Inner Self comes through as Intuition or the “Inner Voice”. It helps its “occurrences” to find Balance or Harmony. Most of the time people are not able to listen. When this happens they move away from their Path (Tao). The Inner Self also influences our exterior. It gives us Signs. Most people in the West don’t understand or see the Signs. If they see a Dove in a place where there are no doves (a strange coincedence) they don’t understand that The Higher Self is advising them to follow their Heart and stop Thinking (The Dove is the Symbol of Sufism and Gnostics). Later in this Blog I want to tell you about Wolfgang Pauli. He was a very intelligent Scientist involved in the creation of Quantum Mechanics. He was gifted with a strange talent called the Pauli Effect. Everywhere he came “Psycho-Kinetic Effects” started to happen. These effects could not be explained by Science. They were always connected to something Pauli was Trying to Find Out. The Signs contained a Deeper Symbolic Meaning. Seth explained that to use Jane Roberts he had to shift to another “frequency” in the Universe. His Time/Space was on another “Plane of Vibration“. To get into contact with Jane he had to create a “Resonance-Pattern (a channel)” with the “Standing-Wave” of Jane Roberts. When this channel was accomplished he was able to link his Symbols to the Symbols of Jane. Jane was not chosen by accident. Her “State of Mind” was able to resonate with the State of Seth. When you want to channel your “State” is crucial to the connections you are making in this “strange” Universe. When you’re “wave-length” is “low” you attract “lower” entities of other planes of vibration. They will tell different stories because they are not aware of the “higher” planes. The same applies to your contacts on Earth. You attract people of the “Same Wavelength“. When you’re wavelength is low this does not mean that You are a Bad Person. It means that something is connected to you that is influencing you’re wavelength. Although this sounds strange people are able to give “their problems” to others. This is a big problem when you are Empathic (from the Heart). I am Empathic and it took me a very long time to understand why I was carrying “Strange Moods” when there was no reason for it. When you are an Emphat you are able to understand people with ease but when you “move into the other” without any protection the chances are high that you take something over. The Others love you for this. They feel refreshed and happy and You are suddenly in their state. When we translate channeling in “Getting an In-Spiration” we can see that channeling is not new. It happened in every time in the History of Humanity. An inspiration is received when you are able to Articulate your Intuition. A very important condition is Tension. When you are looking for an answer and time is running out You suddenly know! Artists use this (called dead-lining) to make sure their expression is the best they can do. They have to wait for the Magic Moment and when this moment appears they are taking over by the Creative Force. In earlier times these people were called Magicians, Prophets, Druids, See-ers, Artists, Bards and Poets. In our time the distinction is much more difficult to make. In every place in Society there are people who are equipped with a strong Intuition and/or Empathy. A nice test to find out “What you Really Are” is the Myers Briggs Test. Many very important discoveries in science appeared when people got into a highly intuitive state induced by Tension. A famous example is the “discovery” of the Benzene Ring by Kekulé. A very interesting case is Wolfgang Pauli. Jung (1875-1961) and Pauli (1900-1958) met in 1930 when Pauli asked Jung to help him with his Emotional and Psychological Tensions. Jung reviewed thirteen hundred of Pauli’s dreams and studied a selection from the first four hundred of these. Pauli was a brilliant scientist, highly involved in the creation of Quantum Mechanics. Jung was never able to understand everything Pauli discovered. He was not a mathematician. What nobody understood at that time was that Pauli was creating the Bridge between Physics and Psychology. He found this bridge when he started to study Alchemy. He found out that the so called Lumen Naturae (Paracelcus), the Light of Nature, or “Spirit in Matter” was “The manifestation of something deeper, an Unus Mundus that is also the domain of Symmetry“. He believed that this Light was the Source where “Mind and Matter, Religion and Science originate“. At this moment Symmetry is the most important issue in Physics. It is needed to solve the “Multi Dimensional String“-equation (The Beta Function) that is played by the Cosmic Violin Player in Super String Theory. What Pauli discovered was that there are two worlds. The Masculin World of Order (The Circle) and the Female World of Chaos (The Square). When the two worlds connect Synchronicity takes place. The Masculin World is controlled by Rhythms, Patterns and Clocks. Many people think this is a Power who is Controlling Human Destiny called God. In reality it a Power that is Able to Create. It is able to create when We, the Humans, use it. It is the Power Seth talks about when he explains the Power of our Mental Projections. The vertical circle is a blue disc with a white border divided into 4 X 8 — 32 partitions. A pointer rotates upon it. The horizontal circle consists of four colours. On it stand four little men with pendulums, and round it is laid the ring that was once dark and is now golden (formerly carried by four children). 1) The small pulse: the pointer on the blue vertical disc advances by 1/32. 2) The middle pulse: one complete rotation of the pointer. At the same time the horizontal circle advances by 1/32. 3) The great pulse: 32 middle pulses are equal to one complete rotation of the golden ring. 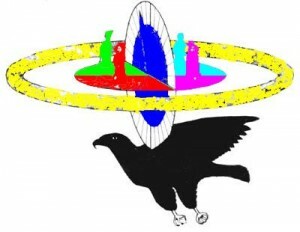 …It is supported by the black bird“. 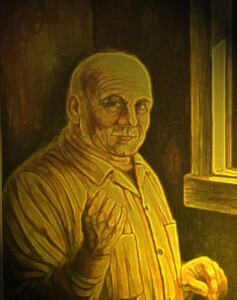 It is very clear that Pauli saw a “modern” version of the Vision of Ezekiel. The Female World (the Moon) is the World of the Game played on the Square. It is the World where The Human is a co-creator with a Power that shows Herself as a Trickster. 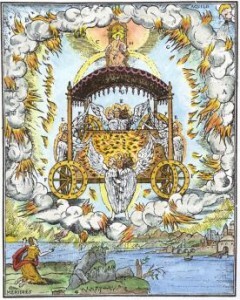 The Male World of the Sun is the world of Control and Order. The Male World defines the Rules that are Played when the Game is created. She is Playing Games to show the Human that he has aquired Free Choice (not Free Will) and HAS TO USE IT. “God” will never interfere with our Free Choice because Our Free Choice is God. God is the creator of the many paths that are there to explore. When both World (Male and Female) are in Harmony, the Human Co-Creates with The Creative Force (The Dove, The Holy Spirit) of God and moves unto the Path that is created for him to explore. This Path is there to learn the lessons that his Soul has chosen to learn in the Learning Simulator called Earth. The Past and the Future are already there and the Now is the starting point to move back and forwards in Time and Up and Down in the Six Multi-Universes that are connected to our Seventh Universe, the Universe of the Heart. The idea that Future and Past are interacting in the Now is called Wheeler-Feynman Absorber Theory. It predicts that the Future influences the Now. Jung asked Marie-Louise Von Franz (Number and Time) to research the domains of Pauli he was unable to understand. When I searched the Internet to find more about Pauli and Von Franz when I found the website of Remo Roth. Remo Roth and Marie Louise von Frantz worked together to explore Pauli’s heritage. 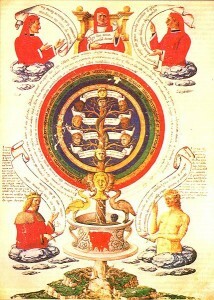 “It is now 33 years ago that I began to dream and have visions about the Seal of Solomon. In one of the first visions dating from July 1973 I saw two open graves. One of them had a tomb stone with a Christian Cross on its top, the other one a stone with the Seal of Solomon, the Heart Chakra, chiselled into its surface”. “Further, already in 1974 I read in Marie-Louise von Franz’ book Number and Time about a dream/vision/audition of “a modern physicist” that dealt with the Seal of Solomon and the square – exactly the symbolism also my vision talked about. Of course I was completely fascinated by this vision and asked Marie-Louise von Franz about the dreamer. She allowed me then to publish his name; it was Wolfgang Pauli“. “In April 24, 1948 the foundation of the C.G. Jung institute took place. When Pauli entered the room, a so-called Pauli effect occurred. Without any outer cause a Chinese vase fell onto the floor and the water poured out, resulting in a flood. Symbolically seen, we can say that this psychokinetic event was a Chinese water flood“. “Pauli had begun to deal with the hermetic alchemist Robert Fludd, who wrote his name in Latin as Robertus de Fluctibus. Therefore, we can conclude that these two events belong to a Synchronicity, the psychic (inner) event of it consisting in the tension in Pauli concerning the dispute between Johannes Kepler and Robert Fludd, the physical (outer) event in this strange psychokinetic anomaly, the Pauli effect of the overturned vase, resulting in a flood“. “Symbolically seen we can say that the meaning of this flood is as follows: An archetypal conception which has a lot to do with “Watery” and “Being Liquid”, which was still living in Fludd’s hermetic alchemy, but repressed after Johannes Kepler, wishes to be integrated in the new Zeitgeist of the 21st century (The Age of Aquirius, the Water Bearer)” . “In Robert Fludd’s hermetic alchemy the world soul, the anima mundi, was still the vinculum amoris (ligament of love) of matter and spirit. Thus, we can conclude that a meaning of Pauli’s synchronicity is the challenge of going back behind Kepler to Robert Fludd with the goal of finding a new synthesis of the Divine Male Principle with the Female“. “By means of a symmetrical symbol, the Seal of Solomon, which pursued him in so many dreams and visions, Pauli is now able to define the dark female part, matter, as a mirrored image of the spiritual layer, and vice versa. This material trinity unifies with the spiritual one, leading by this into a new sphere, the psyche which he calls here the “realm of the middle” (i.e., China)”. What Roth is trying to show is that we are at a “Point of Transition“. We have to stop Male Dominance (Order) but we also have to stop Female Dominance (Chaos, The Trickster, Playing Games). What we have to accomplish is a New Synthesis of the Divine Male and the Divine Female principle (The Holy Wedding). We have to start to act with Spirit and our Soul again. We have to use the Creative Power that comes out of our Heart. The “Realm of the Middle” has a lot to do with China. The Culture of China was aimed at Harmony. 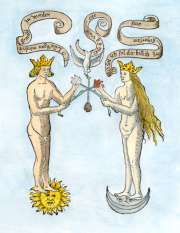 The Seal of Salomon “symbolizes a potential world that contains a new creation”. This New World is the world of Aquirius. When we want to find its foundation we have to Move back in History and Start all over Again. We have to become aware that We Are The Creators and we have to Take the Responsibilty for our Creations. 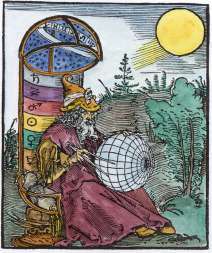 We have to move back to the time of Alchemists (Fludd, Paracelsus), the Essenes or when you believe this, even to Le-MU-ria to find the “Old Tools of Creation” (The first Emperors of China came from the Land of MU). “As a psychotherapist and healer I have the possibility to penetrate into the deepest depths of the collective soul. 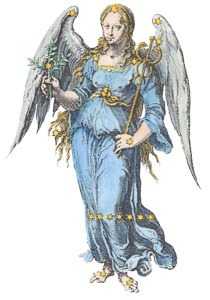 Therefore I can testify that this renewed God-image, the Seal of Solomon, is constellated in many humans of today”. “These observations showed me that all these people were or are already being transformed into a modern mystic, even when they did not know this consciously” (Are You aware of this?). This entry was posted on Friday, October 26th, 2007 at 12:39 pm	and is filed under Completed, Physics, Psychology. You can follow any responses to this entry through the RSS 2.0 feed. You can leave a response, or trackback from your own site. Wow, love your site – thank you so much for this and all the others. I’ve only just scratched the surface here!